Today is a very beautiful day! Gorgeous and sunny. It was in the mid-70's. I even had the a/c on for a little bit. It got a bit cooler in the evening. I was tired this morning and had a hard time getting up, but I dragged myself out of bed. I had trouble sleeping last night. 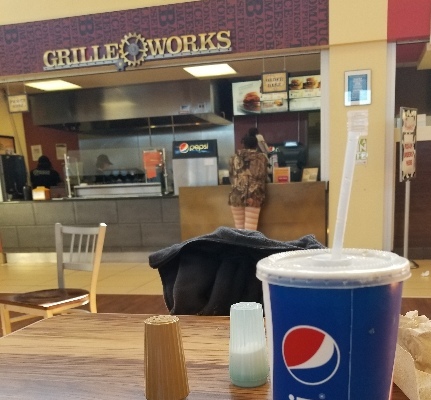 After my class, I had lunch at Grilleworks because the line was too long at Chick-Fil-A. I ordered a double bacon cheeseburger, no bun, and I asked them to chop it up for me. I didn't even bother putting the mayo on it because it wasn't dry! It's like a cheeseburger-salad-stir-fry. So yummy. I'm mostly trying to eat salads, but I got to eat what I can.. 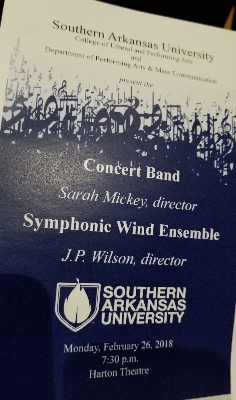 In the evening, we went back to SAU for a concert by the Concert Band and the Symphonic Wind Ensemble. We really enjoyed it! One of the other administrators that David works with was also there, sitting next to us, so it was fun to chat with her. I love these concerts, but they always start at 7:30, which is kind of late, especially for those of us who get up early. No papers/blogs due in my classes this week! Yay! I went to bed kind of early because I was very tired. Last night I woke up in the middle of the night with really low blood sugar! It was not good. I called my doctor later, and she said to stop taking the Glipizide. I decided to just stop the evening Glipizide, and still keep taking it in the morning. I think that without it, my blood sugars will be too high. 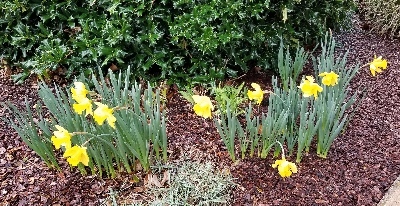 There are a lot of beautiful daffodils and other flowers, all over the campus. You can tell Spring is on its way. My lesson went great. I hated having to go in for the lesson, though, because my only other class was canceled. It's a lot of time, trouble and expensive just to go in for one half hour. No one else would switch with me, though. 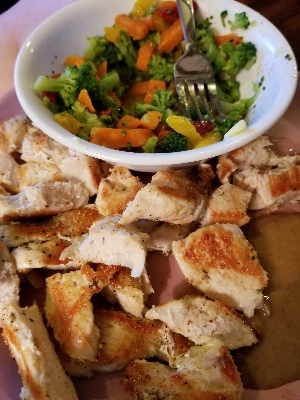 I had bought a bottle of peanut satay sauce, so I cooked up some chicken breasts I had frozen, to dip in the sauce. It was pretty good. I over-cooked the chicken a bit, though. It's very warm and humid today. It's up in the 80's! Wow! 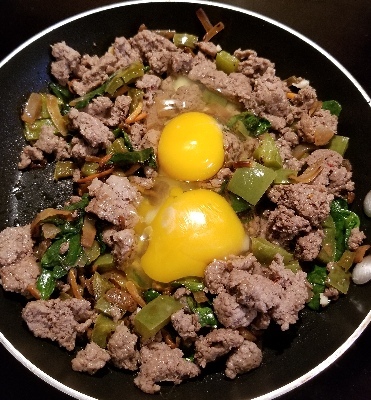 I've been cooking up turkey sausage, eggs and other stuff in the mornings. Still trying to eat healthy! After I got home from school, my new laptop was waiting for me. 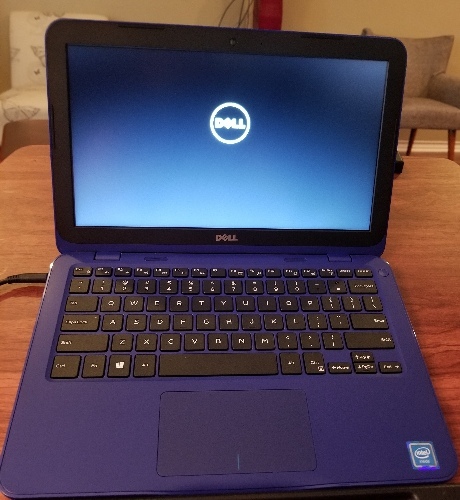 It's a small Dell (Inspiron 11, 3000 series) that is very lightweight, so I can carry it around easier. I'm very happy to have it. Getting a new "toy" is always exciting. I spent a bit of time tonight setting it up.. When I started it up, it talked to me! That was Cortana, I guess. It was kind of funny. We watched a new Chris Rock special tonight. It was so funny! 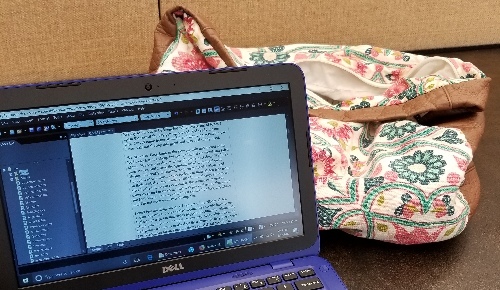 I'm using this oversized purse that I got at Ross in Hawaii to carry my laptop and notebook now. So much easier! Originally I got it to use as a gym bag, back when I belonged to 24 Fitness in Honolulu. It's very nice, one of those flowery ones, but it has some leather as well. We took Brandy in to the vet's office today to be kenneled. 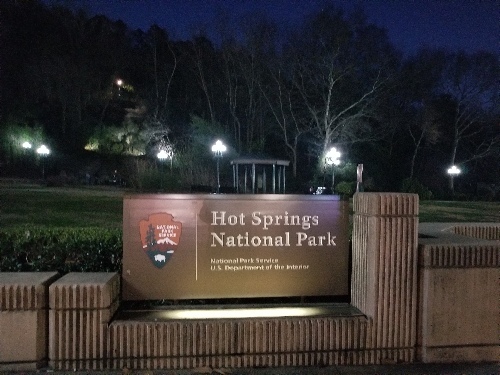 Tomorrow we're driving to Hot Springs, AR. David has a meeting there, and then we'll spend the night. It should be fun. It's always nice to get away. 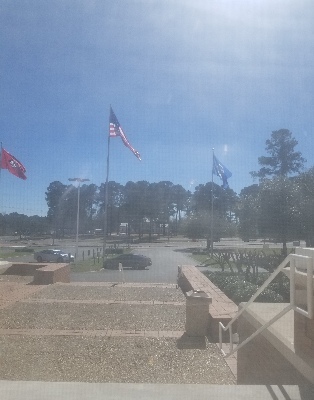 Beautiful weather today, in the 70's. I didn't have Brandy to walk, but I walked around the neighborhood by myself and took some photos of all of the flowers around. A few have started coming back in our front yard. There's this type of tree here that everyone calls a tulip tree, but there's already another tree called that. 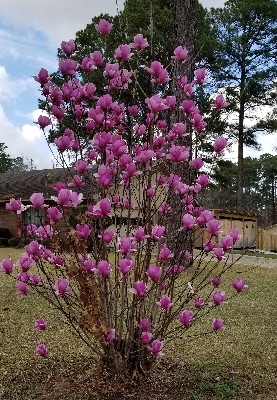 This is actually a Saucer Magnolia. We have one in our backyard as well, which I didn't even notice at first! I spent most of the evening getting ready for our trip tomorrow. We left around noon. We stopped somewhere along the way so that I could use the restroom...then we stopped in Arkadelphia at the McDonald's there (there weren't any other places I could eat). 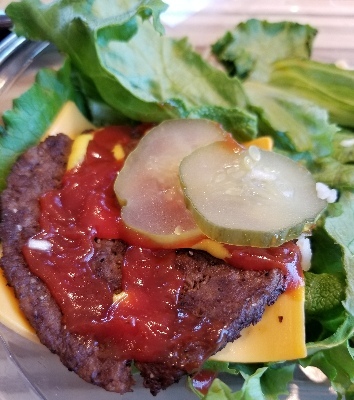 I just ordered two cheeseburgers, no bun, but they gave me a ton of lettuce and ketchup with it. It was like a salad! We stayed at the Arlingon Hotel. It's a really old and large place. The place was recently bought out by some rich guy who's been refurbishing it. Driving through the town, it took a while because there were a lot of stop lights. As we stopped at one light, we saw a man, standing on the street corner, smoking, and holding a very large fish. No kidding! I wish I had taken a photo, but it wasn't the best angle. David was in a rush to get to his meeting, so he just dropped me off at the entrance. I didn't even get time to get my laptop out of the trunk! Oh, well. I checked us in and went up to our room. It's a very nice room. I was reading some of the complaints online, and it's clear that they have fixed up a lot of things. It's a fairly clean room, and it has a brand new flat screen TV. Some people had complained about the rooms being dirty and having old TV's, so they did fix that. Also, they have some extra power strips by the bed, to make up for the lack of outlets (another complaint online). However, the TV only gets about 16 channels. It doesn't have either one of those things where you could pay for movies, nor did it have HBO, so that was annoying. I was bored, so the only thing to watch was an SVU re-run. I couldn't get the closed-captioning to work, so I called and they sent this old guy. He said that they needed the master remote control to put on the CC, so he got that and we fixed it. Also, it was cold in the room, and the heat didn't work. I'm not kidding...He said that this time of year, they put on the a/c in the hotel, and put o, the heat in the evening. Basically, our controls did nothing. Why bother to have them, then??? So stupid. It was cool outside, too, so having the a/c on made no sense. I'm guessing that's one of the things they need to fix. Also, in the bathroom, under the mirror, on this little shelf, there was some kind of dirt or powder. He said it was probably sand from behind the mirror. If they're drilling on the other side, then the sand would leak out. Not a very good explanation as to why it's there and hasn't been cleaned up. He sent the maid to clean it while we were out, but she didn't do a very good job as there was still some stand there. The hotel dates back to the 1800's, so it has some neat old stuff, like an old-fashioned heavy metal key; and a mailbox drop; and the elevators have one of those old-fashioned things at the top that tells you where the elevator is (but it doesn't work any more). I hope they don't get rid of these neat little touches when they update it more. 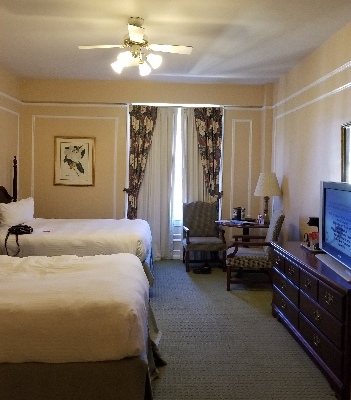 You could tell that the hotel used to be nicer, and I hope they do fix it up even more (although, they'll probably then raise the prices, so we won't be stay here). You can tell there were patches on the paint and stuff like that. One of our bedsheets was ripped at the corner. I don't care, as long as it's clean and comfortable. We got a good price. 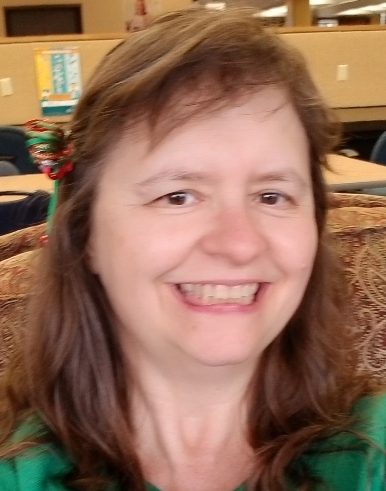 My blood sugar was low, so I had to run downstairs to the coffee place and get some juice and chips (they didn't have anything healthy to eat). I'm trying to eat less, and eat healthy, but the medicine brings my blood sugar down very low if I'm not too careful. I don't always remember to eat lunch. After David got out of his meeting, we had a little time to kill, so we went downstairs to check out their bar. It has a nice veranda to sit on, that people like, but it was a little too chilly to sit out there. 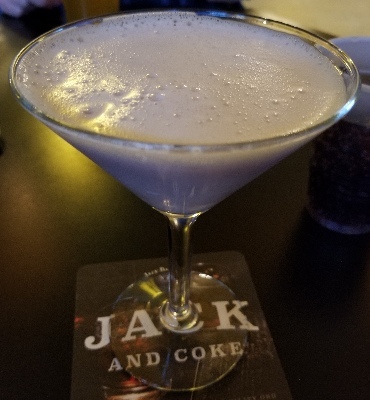 I had a good chocolate raspberry martini. Then we went to dinner at their seafood buffet. It was really outstanding. 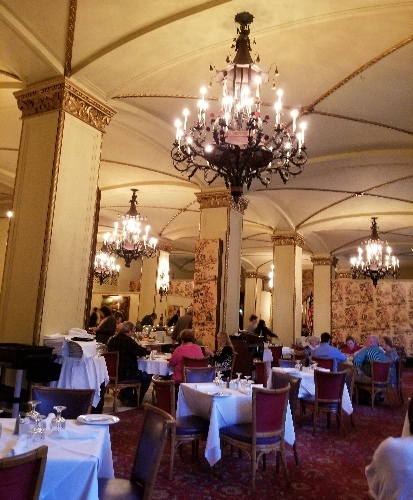 They had just about all of the seafood you can imagine: crab legs, oysters, cod, two kinds of shrimp; plus prime rib, other hot foods, and tons of salads and desserts! I asked for someone to tell me which foods were gluten-free, so the chef came out and took me on a tour of all of the food. He was very nice and even made me a special flan, since I couldn't eat any of the other desserts. I had a lot of wonderful salads, some crab and prime rib. This was probably the best buffet I've ever eaten at. Unfortunately, I think I did get some gluten by accident (from cross-contamination) because I got very sick a few days later. 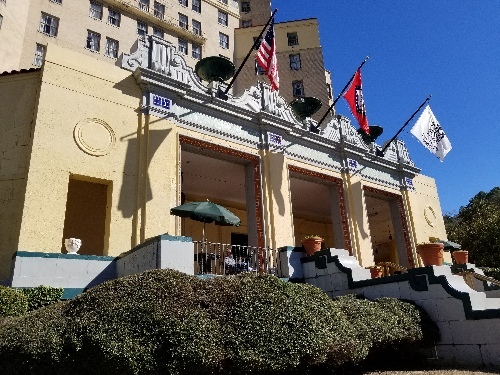 The hotel is right across from the Hot Springs National Park. One of these days, hopefully we'll stay long enough to actually see it! We walked down the street (we're near the downtown). Most of the shops were closed. 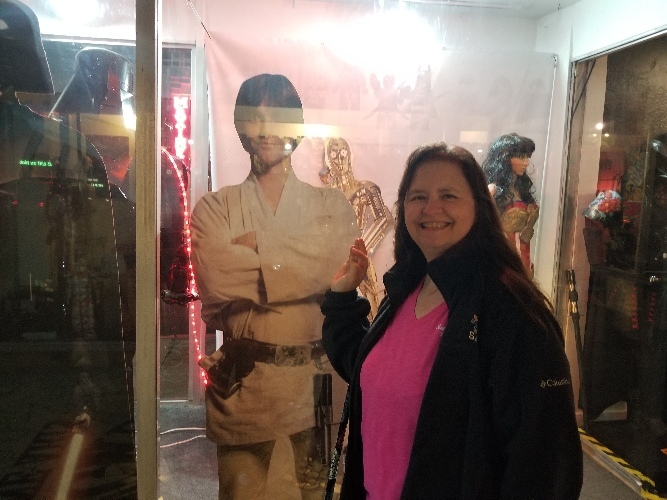 Too bad because there was this amazing Star Wars store called "The Galaxy Collection." I took a lot of photos of the displays in the store window. After that, we walked down the avenue, and we found a German pub. We went in there for a little while. I had an apple cider by Stella Artois that was very good. It really tasted like apple cider (most of the ciders I've tasted, taste too tart to me). 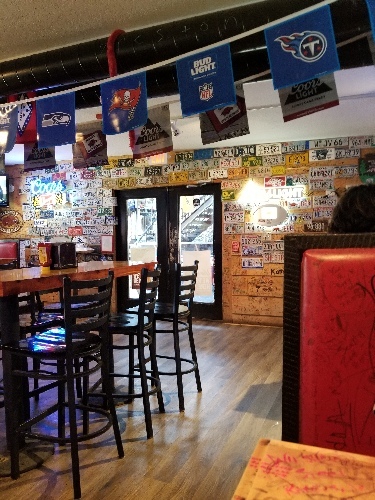 The food looks good - we'll have to go back there someday. Unfortunately, both of our phones were running late while we were there. We wanted to call Lyft to go to the casino (at Oaklawn race track), but we couldn't without our cells. David went to the ATM, so we could get a cab. There was a nice old couple who sat down near me, and I chatted with the lady for a while. David had a hard time finding the ATM because the bartender had pointed him in the wrong direction. Eventually he found it, and returned, and they called us a cab. We went outside to wait, and it took quite a while, but the cab did come. 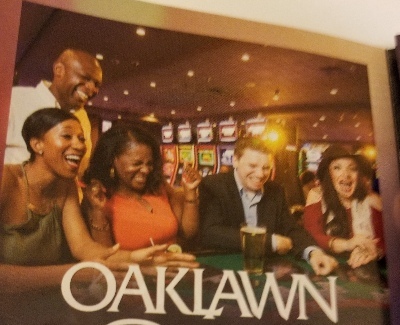 We went over to Oaklawn and had a great time. I kept winning! Not a lot, but enough, here and there. We actually came out ahead. It was very cool. That doesn't happen very often, even with all of the times we've gone to Vegas. We stopped by the hotel bar on our way back to our room, but it was really jam-packed with people, and the bartenders were overwhelmed. They had a really terrible band playing. I'm not kidding - they were awful. I realized that they were singing some Rolling Stones song because I recognized the words, but the tune was indecipherable. 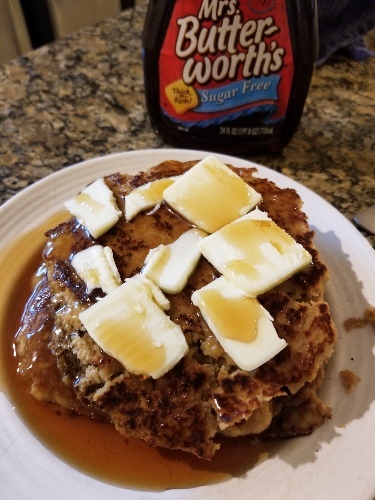 The next morning, I was hoping to go to a restaurant down the street that had gluten-free pancakes. Unfortunately, they're very popular, so it was a 45 minute wait. We found a place near there called Fat Jack's, which was serving breakfast, so we went there. It was kind of a dive. The food was not very good! I just had some bacon (that was the only thing that tasted OK), a little fruit, and one sausage that was not very good. I had brought my NIMA gluten tester with me. The eggs were not gluten free. We probably should have eaten breakfast at our hotel instead. I was very annoyed at myself to learn that Fat Jack's had karaoke Friday and Saturday night! So we could have gone there. Drat! Oh, well, we had a lot of fun winning at the casino instead. We checked out around 11 and then drove home. We stopped briefly at SAU so David could do something in his office. I had a nap. Later, I made some bacon, and some gluten free pancakes. I had really been craving them! It would have been nice to stay another night, but David had a lot of work to do. My issue of Gluten Free Living & More came in the mail. They always ask a question of the readers, and if you answer, they might put your answer in the issue, and they put you in a drawing for a basket of gluten-free products. 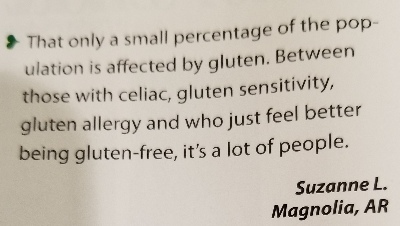 I got my name and answer in, for this month's question, "If you could clear up one misconception about food allergies or Celiac, what would it be?" I got a new scale (I ordered it a while back but hadn't bothered to open it until now). David has a nice one, and I just usually use his, but I figured I should have my own, especially since I'm seriously dieting now. I haven't lost much weight yet. I'm starting around 172. This is a pretty cool scale...it measures not only weight and body fat, but how much water you drink. I'm not surprised to see that I'm overweight, obese, and not drinking enough water. I do actually drink a lot of water, but being sick a lot makes me more dehydrated. I spent a lot of time today picking up the house, unpacking, etc. We went to the Wal-Mart for groceries, as usual. I found a pizza that's not only gluten-free, but low-carb. 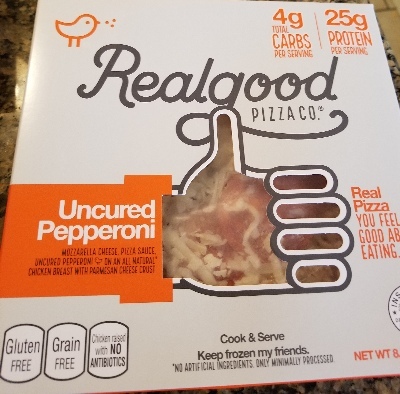 It's called Realgood Pizza Co. The crust is made out of chicken breast and cheese. You know, if you call your product "real good," it really should be. This pizza is not very good. Oh, well. At least it didn't make my blood sugar spike. Back to my diet and eating salads! Although, I didn't go too crazy while we were in Hot Springs, either. I made some sugar free Jello this week and had some, which is one of the things that helps me get through the dieting! Tonight is the Oscars! I always DVR them and then watch them later, and save them to DVD. However, it means that I have to stay off social media until I watch it or I'll be spoiled! That's tough for me.